This week’s Fantasy Baseball Prospects Report ended up being a tad pitcher-heavy after the Braves decided to shake up their rotation a couple of times. Two rotation arms were optioned to Triple-A, opening the door for arguably the Braves top two pitching prospects to step in and make an immediate fantasy impact. That is, until Atlanta’s 2018 breakout arm returns from the IL within the next week. Yeah, it’s still a cluster. If any farm system can make the argument that they have better pitching talent and/or more pitching than the Atlanta Braves, it’s the San Diego Padres and the New York Yankees. I dive into those two systems in this week’s player spotlights to profile one of the hottest pitching prospects in the minors out of the Padres system along with an arm in the Yankees system that is poised to break out in 2019. Discussing the Atlanta Braves pitching prospects is always an exciting topic. I’m sure the Braves are just beside themselves with all the mound riches they have in their system. When your top pitching prospects are Mike Soroka, Touki Toussaint, Ian Anderson, Kyle Wright, Bryse Wilson, Kolby Allard, Luiz Gohara, Joey Wentz, and Kyle Muller, how can you not be? That’s just their top nine too. Their system goes much deeper (I hear you Patrick Weigel supporters) with pitching talent. The “problem” with having all these arms is how do you fit them all into one rotation. It’s a great problem to have, especially when you already have Mike Foltynewicz, Touki Toussaint, Sean Newcomb, Kevin Gausman, Max Fried, and others under contract as well. So, how the heck does this all pan out in 2019 and beyond? 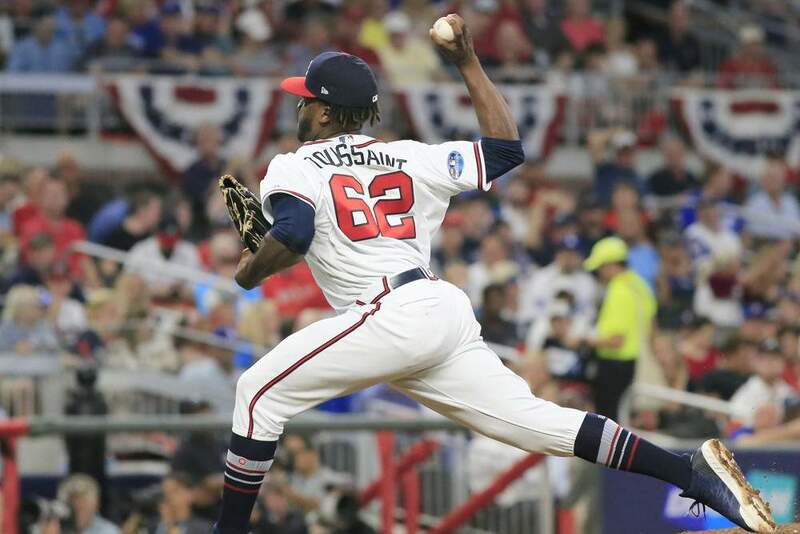 Toussaint pitched six strong innings of relief after Newcomb was yanked early and likely moves into Newcomb’s spot in the rotation. There have also been rumblings of Soroka being used in a spot start later this week ahead of Folty’s return to the rotation this weekend. Whether that happens or not, consider Soroka the next in line if the need arises for another starter. The leash on every single starter, outside of Foltynewicz, is fairly short. With all the high-upside arms knocking on the door, a few bad starts in a row from Gausman, Teheran, or Fried could cost them a spot in the rotation. For now, Toussaint is a strong waiver wire add and I’d be stashing Soroka anywhere I can. Long-term, the aforementioned duo, plus Ian Anderson, have the brightest upside if you ask me. Teheran has a team option for 2020 and hits free agency in 2021 while Gausman has one more year of arbitration before also hitting free agency in 2021. You can almost kiss them goodbye already. It’s crazy to say that Atlanta could have an all-homegrown rotation within the next few years, but it’s a distinct possibility here. For dynasty, Anderson, Soroka, Toussaint, and Wright would be the four arms I’d put the most stock in with Wilson and others right behind them. These things always have a way of working themselves out and nobody is a lock to reach their ceiling here, but don’t be shocked if one or two of these arms get dealt or move to the bullpen. Who’s the Man in Houston? And by Houston, I mean Triple-A Round Rock… for now. For the last couple seasons, the Astros have had two top hitting prospects in Kyle Tucker and Yordan Alvarez. Basically every prospect list known in existence has had Tucker ahead of Alvarez, including my own. In my top-250 back in February, I ranked Tucker 9th and Alvarez 25th. With both currently at Triple-A Round Rock and performing quite differently, is it fair to ask if Alvarez is passing Tucker? Yes, the answer is yes. Now, Tucker made it to the Majors already last season but only recorded nine hits in 64 at-bats. If you dig deeper, Tucker was a little unlucky with a .176 BABIP, so we can’t really read too much into the small sample size. Still, the Astros assigned Tucker to Triple-A to start the season where he has struggled mightily to start the season with only four hits in 42 at-bats. On the other hand, Alvarez has mashed thus far with seven homers and more walks than strikeouts. With how each has performed this season, it makes you wonder who the Astros give the call to first. Looking at the Astros depth chart, there are three spots that could potentially open up for one or both of these elite prospects. Those being right field, first base, and DH. Both Josh Reddick (RF) and Yuli Gurriel (1B) are hitting for average without much pop and Tyler White (DH) hasn’t done much of anything at the plate this season. So maybe, White gets bouned soon if his struggles continue. If that is the case, I’d bet on that call going to Alvarez instead of Tucker with how each has started 2019. Now, let’s look long-term. Which guy is the better dynasty asset? If I was to re-rank my top-250 today, I’d still have Tucker ahead, but Alvarez would only be a few spots behind. When comparing the two, I’d give the slight batting average edge to Alvarez, speed to Tucker, and power fairly equal. That’s one area that has improved for Alvarez of late, especially last season as seen below. Alvarez is hitting the ball in the air 10-15 feet further on average now than he was in August and September of 2017 and raised his fly ball rate to 44.4% so far this season. With the more fly ball heavy approach, Alvarez’s plus raw power continues to be more and more prominent each season. At this point, I’m expecting a 30-35 home run hitter to go along with a batting average in the .280-.300 range. The same power projection could be slapped on Tucker as well, but with his overall hit tool, he might be a tad lower in the batting average department. The difference between the two, and what still makes me give the nod to Tucker, is the speed that Tucker brings to the table. Alvarez should be good for a handful of steals per season, but Tucker has the speed that should allow him to routinely reach the teens at least with the potential for 20-plus. Down Goes Bart – Gosh darn it. Joey Bart, the top catching prospect in the game, will miss the next 4-6 weeks with a fractured hand. The Giants had bumped him up to high Single-A San Jose in the California League this season where Bart was hitting .270 with two home runs through his first 10 games. Erik Swanson Recalled from Triple-A – With Wade LeBlanc hitting the IL with a grade-2 oblique strain, Erik Swanson was recalled to take his spot in the rotation. Swanson came over to the Mariners as part of the return package for James Paxton this offseason and carries some back-end fantasy value as long as he’s in the rotation. He’ll get the struggling Indians today followed by a road start in San Diego and a home start against either the Rangers or Cubs at the end of the month. Richard Lovelady Added to Royals Bullpen – The Royals bullpen has been absolutely atrocious this season with the 3rd worst bullpen ERA through the first few weeks. With a plus fastball/slider mix, Lovelady has the stuff to succeed in the late innings and could get a chance to rack up some holds with only one other lefty in the Royals pen. If you play in a league that counts holds, Lovelady makes for a solid waiver wire addition. Few prospects have rocketed up the rankings over the last two years quite like Luis Patino of the San Diego Padres. After signing with the Padres out of Colombia in 2016, Patino made his professional debut in 2017, dominating over 56 innings combined between the Dominican Summer League and the Arizona League. He received a bump to the Single-A Midwest League last season and dominated there too, posting very impressive numbers for an 18-year-old who was quite young for the level. This season, Patino stepped up to high Class-A, and while he’s been a little wild, has only allowed two earned runs in his first eight innings of work. While the stats are impressive, Patino’s dynamic arsenal is what has him about to enter the elite pitching prospects club. He sits in the mid-90s consistently with strong life and can add a tick or two when needed. Offsetting the heater is a dynamic mid to high-80s slider with hard two-plane tilt and a nearly as effective curveball. Both benders are swing and miss pitches, and paired with his electric fastball, have allowed Patino to rack up well over a strikeout per inning and should continue to do so moving forward. Patino’s delivery has a similar high leg kick to fellow Padres prospect, MacKenzie Gore. But like Gore, Patino is able to repeat his delivery well. There’s a little bit of effort in his delivery, but nothing that has thrown his mechanics out of whack. Patino operates out of a high 3/4 arm slot and gets good extension in his delivery. Another look at the cut on #Padres Luis Patiño’s fastball on Sunday. He touched 98 and 99 MPH, sitting 95-97 comfortably. The one area I would like to see him improve is his changeup. When he’s throwing it well, it’s flashed at least average potential. The problem is that Patino is very inconsistent with the offering and tends to leave it up at times where it gets hit hard. Patino is still very young and has plenty of time to develop his changeup, and it helps that the Padres organization has some great minds to help him along the way. Ultimately, there’s #2 starter upside in my mind with the potential for low ratios and over a strikeout per inning. I wouldn’t call Clarke Schmidt an unknown by any stretch of the imagination. However, he’s yet to garner a lot of love in prospect circles. Keyword there being “yet”. A big reason for the lack of love is due to the fact that Schmidt just made his 10th career professional start last night and has combined to throw only 36.1 innings so far. You can thank Tommy John surgery for that. Even with a so-so outing last night, Schmidt’s career numbers are still solid at a 3.22 ERA, 1.07 WHIP, 3.0 BB/9, and 11.9 K/9 in those 36.1 innings. Schmidt features four above-average or better pitches, with the fastball featuring heavy sinking action and arm side run. I personally think his changeup is his best secondary offering, but as long as Schmidt has a couple of secondaries working for him each start, he’s going to be tough to hit. If we’re talking strictly upside, I’d put Schmidt third amongst Yankees prospect arms, behind only Deivi Garcia and Luis Medina. And frankly, Schmidt might have the highest floor of the trio. There’s mid-rotation upside here and Schmidt should move quickly, assuming his arm woes are behind him. This is an arm to target now in dynasty leagues before his price rises. This spot will highlight some top prospect performances and trends throughout the season. Yordan Alvarez (HOU): .344/.500/.969/1.469, 6 HR, 12 RBI, 9 R, 10/6 BB/K over the last 10 days. Luis Robert (CHW): .475/.512/.875/1.387, 3 2B, 2 3B, 3 HR, 3 SB, 11 RBI, 12 R over the last 10 days. Is the only hitter with 4+ HR and SB. Heliot Ramos (SF): 4 HR and 2 2B over the last 10 days. Will Smith (LAD): 3 HR and 9/6 BB/K over the last 10 days. Vidal Brujan (TB): Hitting .333 with 8 SB in first 50 PA.
Anderson Tejeda (TEX): Hitting .395 with two HR and five SB. Kyle Isbel (KC): Hitting .390 with eight XBH and five SB. Keston Hiura (MIL): Has hit four homers in last nine games. MacKenzie Gore (SD): 10 IP, 6 H, 0 ER, 2 BB, 15 K in first two starts. Dylan Cease (CHW): 10 IP, 5 H, 0 ER, 1 BB, 9 K in first two starts. Brusdar Graterol (MIN): 17.1 IP, 1 ER, 18 K in first three starts. Logan Gilbert (SEA) and Ryan Weathers (SD): 22 K each through first three starts. Grayson Rodriguez (BAL): 11 scoreless IP with 20 K in first two starts. Enyel De Los Santos (PHI): 12 IP, 1 ER, 19 K in first two starts. Tyler Phillips (TEX): 19 scoreless innings to start the season. Zac Gallen (MIA): 13 IP, 3 H, 1 ER, 0 BB, 19 K in first three starts. Prospects currently in the minors that can make the biggest 2019 impact. This is a combination of ETA and potential 2019 impact. Nick Senzel, 3B/OF, CIN | Last: 1. In extended spring training now and should return to Triple-A within the next week. Keston Hiura, 2B, MIL | Last: 2. Strikeout rate is way up, but Hiura has slugged four homers in his last nine games. Nate Lowe, 1B, TB | Last: 4. Has five hits in last three games but now up to seven straight games without a homer. Carter Kieboom, SS, WAS | Last: 5. Scorching hot of late and could force a promotion soon. Kyle Tucker, OF, HOU | Last: 3. Off to a 4/42 start to the season. Michael Chavis, 3B, BOS | Last: 6. Working out at 2B in Triple-A could speed up his MLB arrival. Brendan Rodgers, SS/2B, COL | Last: 7. Has only 1 RBI (solo HR) in his last 10 games. Yordan Alvarez, OF, HOU | Last: 10. On fire to start the season and poised to leapfrog Kyle Tucker. Austin Riley, 3B, ATL | Last: 8. Strikeout rate has improved, but only currently hitting .180. Bo Bichette, SS, TOR | Last: 9. Outside of a three-hit game on 4/13, Bichette is ice cold right now. Mike Soroka, RHP, ATL | Last: 3. Rumored to get a spot start. If not, he’s still next in line in Atlanta. Jesus Luzardo, LHP, OAK | Last: 1. Has not made season debut yet. Still shut down. Forrest Whitley, RHP, HOU | Last: 2. Rocked in last start, but doesn’t change ETA at all. Kyle Wright, RHP, ATL | Last: NR. Back to Triple-A but should be back up later in the season. Brent Honeywell, RHP, TB | Last: 5. Yet to make season debut. Dylan Cease, RHP, CHW | Last: 8. Up to 10 scoreless innings to start the season. Jon Duplantier, RHP, ARI | Last: 6. Tossed three no-hit innings in return to Triple-A. A.J. Puk, LHP, OAK | Last: 7. Yet to make season debut. Justus Sheffield, LHP, SEA | Last: 9. Has an 8/3 BB/K ratio through first two starts. Photo/Video Credit: Kyler Peterson, Prospects Live, Emily Waldon, Rob Friedman (Pitching Ninja), David John Griffin/Icon Sportswire. Eric Cross is the lead MLB/Fantasy Baseball writer and MiLB prospect analyst for FantraxHQ and has been with the site since March 2017. In the past, he wrote for FantasyPros and FanSided. He is also a member of the Fantasy Sports Writers Association (FSWA) and a contributor in the best-selling Fantasy Baseball Black Book. For more from Eric, check out his author page and follow him on Twitter @EricCross04. Fantrax is one of the fastest growing fantasy sites of 2019. With multi-team trades, designated commissioner/league managers, and drag/drop easy click methods, Fantrax is sure to excite the serious fantasy sports fan – sign up now for a free year at Fantrax.com.